Eight tab stock Index Set for Medical Charts. In stock and ready to ship. Positions 1-8. 50 sets per pkg. As shown only. Also sold individually. 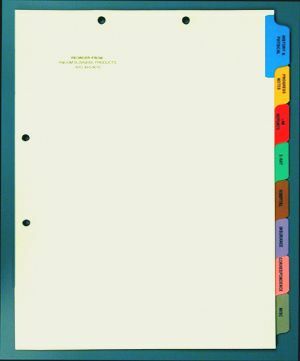 First position (top), blue tab: History & Physical, 2nd position, yellow tab: Progress Notes, 3rd position, red tab: Lab Reports, 4th position, green tab: X-Ray, 5th position, brown tab: Hospital, 6th position, purple tab: Insurance, 7th position, pink tab: Correspondence, 8th position, gray tab: Misc.